Singapore’s multi-faceted history reaches back over 700 years. The arrival of Sir Stamford Raffles on behalf of the East India Company (EIC) in 1819 marked a turning point that set the island on a new trajectory, launching it onto the global stage. Learn the personal journeys of British East India men such as Raffles, Farquhar, and Crawfurd, and those of the many intrepid souls from all over the world — especially China, India, and the Middle East as well as neighbouring countries (today’s Malaysia and Indonesia) — who decided to take a gamble on this new outpost. As we commemorate the 200th anniversary of the EIC’s arrival, join us to explore not only its colonial and pre-colonial history, but also the impact these figures still make on today’s Singapore. This is a multi-part series that may be purchased as either a one-off or a package of three tours. Our journey first leads to Fort Canning Hill — an extensive and fascinating repository of Singapore’s unique history. The seat of power for centuries, it’s been instrumental in the island’s management and defences as reflected in its many names. Thirteenth-century Sumatran kings choose this hill overlooking a bustling river port as the site for their palaces, and the area demanded such exclusivity that it was known as Forbidden Hill. The legends of the Sejarah Melayu (the Malay Annals) charmed Stamford Raffles, who built his residence here to enjoy the beautiful views and cooler breezes. He also set up our first botanic gardens on Fort Canning to experiment with different plants and we can still see its legacy in the Spice Garden that thrives in today’s Singapore Botanic Gardens on Cluny Road. Together we’ll explore both its pre-colonial and colonial history, plus its military heritage as both a fort and later a bunker HQ. We’ll also wander among the tombstones of the former Christian cemetery to hear the stories of our early pioneers. This tour ends at the National Museum, giving you the option to explore the museum’s collection on your own should you wish to do so. The second part of our journey focuses on the Civic District with its wonderfully preserved colonial architecture. We fondly call this tour Three Men & A Baby because as you learn the story behind the founding of colonial Singapore, you meet the three men — Raffles, Farquhar, and Crawfurd — who nursed the “baby” settlement through its birth and infancy. Following in Raffles’ footsteps, we’ll discover the importance he attached to city planning and civic society, and the impact that this had on our immigrant communities. We also explore the challenges faced by his co-founder, William Farquhar, who was literally left holding the baby, but with limited resources to enable him to do this in the way that Raffles envisaged. As we explore the role of the Singapore River in its rapid growth as a trading post we will delve into how both Raffles’ concept of a free port and Farquhar’s reputation as the “Raja of Melaka” helped to attract traders from the Malay peninsula and the rest of the world. And you’ll learn how these different approaches led to their falling out. This tour will end at the Asian Civilisations Museum with the oppotunity to visit its new Raffles exhibition on your own. As we walk the streets of the historic neighbourhood of Kampong Glam, discover the stories of its Kota Raja — the royal compound which Raffles had designated for the newly installed Sultan Hussain. See first hand how the area developed from a fishing village with help from Indian convict labour. 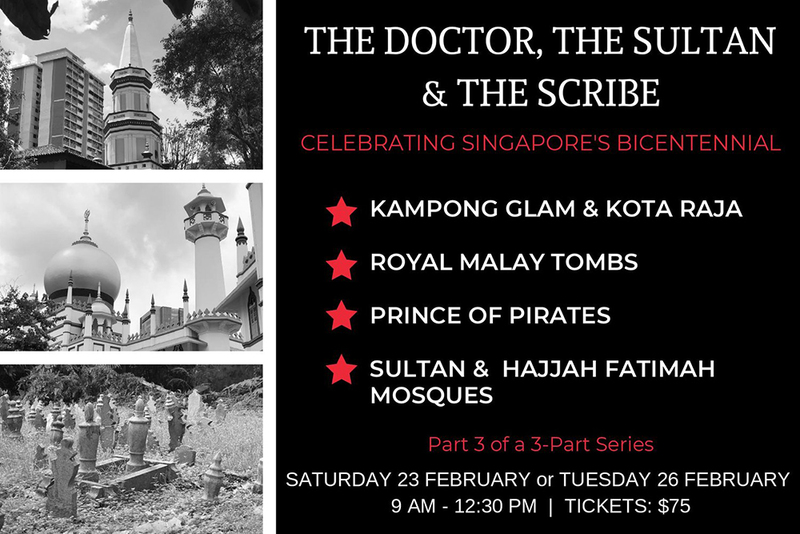 You’ll also visit one of the oldest cemeteries in Singapore that contains royal tombs as well as those of other Muslim communities. Learn how and why our second resident governor, Dr. John Crawfurd, punished the Sultan by building Victoria Street through his grounds. Find out about the Sultan’s contemporary, the Temenggong, aka the Prince of Pirates, and Munshi Abdullah, the father of Malay literature and Malay teacher to Raffles and other early European settlers. Learn how this area became an early printing hub, with the locals having learnt printing technology from the missionaries. Discover how Crawfurd ditched some of the Raffles’ more Utopian plans to implement a more pragmatic approach to the settlement, including the signing of the Treaty of Friendship and Alliance, which effectively bought out both the Sultan and Temenggong and diminished their influence. Visiting both the Sultan Mosque and the Hajjah Fatimah Mosque, we’ll explore the importance of the Muslim faith and how Singapore became a centre for Haj pilgrims in the region to prepare for their journeys to Mecca. This tour ends at the Malay Heritage Centre, the former Istana, or palace, of the Sultan.